Beautiful three bedroom house. 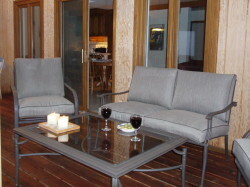 Relax in the sunroom after a day of skiing, hiking, or biking along the many trails. Play Golf at three nearby golf ranges. This home is in the Tahoe Donner Association and includes access to the Trout Creek Recreation Center, Tennis Center, Northwoods pool, sauna and steam room, and Beach Club marina. During summer months there is an equestrian center and lots of scenic hiking nearby as well as an 18 hole championship golf course. Reno is forty minutes away and the ski areas are twenty minutes away. The cross country ski area is five minutes from us. We are five miles from the town of Truckee. All the furnishing are new and we allow well behaved dogs with an additional damage/security deposit.